I haven't been very good posting updates on how the actual pregnancy has been going (symptoms and appointments) besides the initial announcement (read here), how we told our family (read here), and the scare that we had right after finding out we were expecting (click here). 1. Morning sickness. Granted, taking the progesterone every morning made it really difficult to get going and I didn't feel great, but I never got sick. Then two days after I stopped taking the progesterone I got sick. I emailed my doctor and he said he had heard of that happening before and that it was perfectly fine. Probably not the word I would use to describe getting sick, but understandable. The rest of that week was a bit of a struggle, but only in the morning. I also realized that I wasn't eating enough at night and I added a yogurt before bed and since then I've been fine. 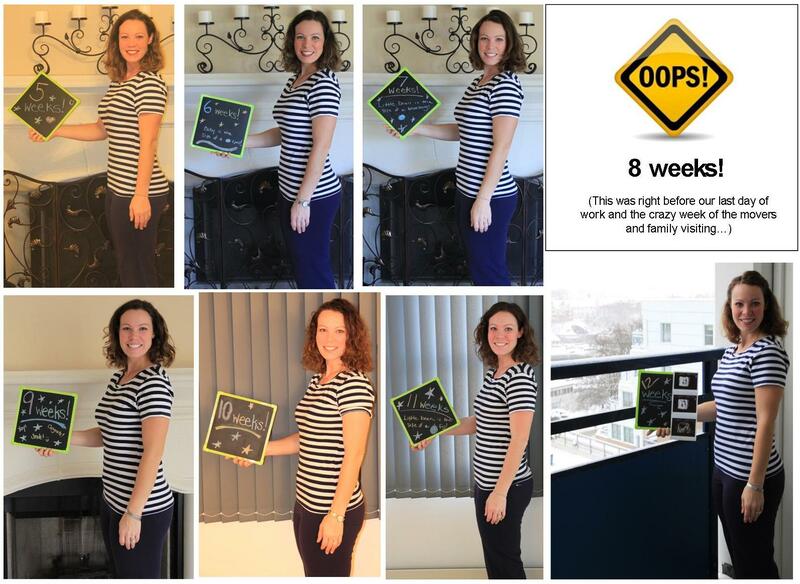 Overall, I would call it a huge success that I was only sick once during the first trimester! 2. Fatigue. Um, yes. In my defense we were also trying to study for the PE exam, get the house ready to put on the market, finish up everything at work and getting ready for the big move to Norway (read here). Yet I still found plenty of time to nap despite hating to nap. I would come home from work, sleep for 20 min, then get up and study for 4 hours and go to bed. Talk about ridiculous! I've started to get more energy, but still a bit sleepy. Fortunately my new office has a nap room. Yep, you read that right, they have a room with a bed and pillow in it dedicated for napping to anyone who needs a rest. I ventured to find said room this past week at work... that 30 min power nap was amazing! 3. Food aversions and cravings. The oddest (and only) food aversion I had was a week when I couldn't eat sweets. Anyone that knows me then knows that something is gravely wrong with that sentence. We even had our 8 week appointment during that time and I had the audacity to tell the doctor that I didn't think the baby was mine because I hadn't been able to eat sweets. Jason just shook his head in embarrassment I told them we could figure out the mixup later, but that I was positive the kids was not mine if it didn't like sweets. Overall though, I have been able to eat really healthy since we got to Norway. We made sure to get our share of our favorite restaurants and foods before we left Houston. Since the move and eating healthier here plus getting outdoors and hiking, I found that I have actually lost 7-8 pounds from my 8 week appointment to my 12 week appointment. I had become slightly fat pants since our hike to Peru and was slightly overweight when we got pregnant so the weight loss isn't something to be concerned about. I've also gotten to the point where I am tired of eating. My sister-in-law made that comment when she was pregnant with her first and I thought she was crazy (who doesn't love to eat?!). But now, when I cannot finish my dinner and proceed to get hungry again two hours later and have to eat, I know understand what she meant. (This really is Jason's baby with a super high metabolism. Grrr.) It's like I have this trigger telling me when to stop (which I think I ignored a lot of the time pre-pregnancy...), but now you cannot ignore it or I feel like I would get sick. I stopped mid-cookie this past weekend and told Jason if I ate one more bite I think I would be sick and handed it to him. 4. Body changes. I really haven't noticed much here. Since I am not showing at all it really doesn't feel like I am pregnant. I was glad to have the 12 week ultrasound to make sure something was still in there since I felt totally normal! 1. 5 Weeks. We also got to have a very early ultrasound and see our little one at just 5 weeks when the doctor was following up on my levels of progesterone and checking to make sure we were still pregnant. Granted there is not much to see and the doctor had to draw the lines on there to measure and help us know exactly where the heck the baby was at inside there! Fortunately, the Lord had His hand of protection around us and our little one. The prayers of a few close friends and family helped us through the difficult time we had early in the pregnancy. I continued taking progesterone through week 10 of the pregnancy. It was probably the most horrific thing about my first trimester. I literally started crying every time my alarm went off and I had to take another dose. So glad that's over with now!! 2. 8 Weeks. We had an appointment with my regular obgyn at week 8 before we left Houston to see the heartbeat and make sure things were still looking good. We didn't do any pre-natal screening as the doctor's office since it would be a hassle to try and get the results and transfer them to Norway, but she did perform an ultrasound and we got to see Little Bean's heartbeat! She did an ultrasound since it was my first visit, but explained to me that normally they only do an ultrasound at 18 weeks. We were glad to be able to sneak in an extra one because it was the first time to actually look like a baby! It also scared the crap out of Jason and I because the baby was moving, squirming, twisting, and JUMPING the entire time! Even the doctor was surprised at the amount of movement and switched the screen to 3D just in time for us to see the little one fist bump me and kick out! And I would like to state that I have ZERO caffeine before this appointment. If our child is moving that much at week 12 I am scared for what the future holds... We both stared at the screen in awe while the doctor laughed and told us to sign up for volleyball and soccer now!